This is updated monthly by the second Tuesday. We are glad you are interested enough in your lake to take a look at this chart. It will be updated monthly just before the Orange County Lake Conway Water and Navigation Control District Advisory Board meeting which is the second Tuesday of each month. The "Nav. Board" is where you can find more information about our lakes. You can also report issues regarding water quality and navigation to them at the meetings. Currently these meetings are being held at the Orange County Facilities Training Room, 2010 E. Michigan Street, Orlando, FL at 6:30 PM. Be sure to check the meeting place and time here. The primary purpose of this chart is to show you the relationship between the current elevation of the lake and the normal level. To accomplish this we have included markers indicating the average elevation of the lake for each month and the daily elevation for the last year. Based on the data from the 30 year period between 1986 and 2015 we also provide a 4 month projection of where the lake level may go. It also contains other information that may be of interest such as the amount of rainfall and water surface temperature. The following description of the data should make it much easier to understand. Each data description is preceded by a symbol which represents how the data will look on the chart. THIS YEAR ELEVATION - This is the daily lake level for the current year. Its scale is on the left side of the chart. LAST YEAR ELEVATION - This shows the daily lake level for last year to help show the expected variation throughout the year. Its scale is also on the left side of the chart. PROJECTED AVERAGE - This is the lake level we would expect if all conditions in the next month or two match the averages recorded during the 30 years including 1981 to 2015 for these months. Its scale in feet is on the left side of the chart. This average was obtained by averaging all the level rises and falls for each month in that 30 year period. AVERAGE MONTHLY ELEVATION - This is the average of the lake levels for each particular month over the the 30 years including 1976 to 2005. Its scale in feet is on the left side of the chart. PROJECTED HIGH - This is the lake level we would expect if all conditions in the next month or two match the average increase recorded over 30 years including 1976 to 2005 for these months. Its scale in feet is on the left side of the chart. This average was obtained by averaging all the level rises for each month in these 30 years. We have only occasionally seen this exceeded in the past 10 years (since projections have been made). PROJECTED LOW - This is the lake level we would expect if all conditions in the next month or two match the average decrease recorded over 30 years including 1976 to 2005 for these months. Its scale in feet is on the left side of the chart. This average was obtained by averaging all the level decreases for each month for these 30 years. We have infrequently seen this exceeded in the past 10 years (since projections have been made). RAINFALL - This is the daily total rainfall. Its scale in inches is on the right side of the chart. It is the total rainfall which occurred each day at a gauge on the north shore of the middle lake. It has been found that normally the lake level will rise about 80% of the rainfall amount with events that are less than 2". The lake is a large enough area that it is unusual for the rainfall to cover the entire lake causing a net rise less than the rainfall measured at one point. On the flip side of this, there have been times that no rainfall was recorded and the lake rose anyway because of rain over another part of the lake. Surprisingly, there is little change in the lake level due to the surrounding watershed until the rainfall exceeds 2". At this point it can take two to three days after the event before the lake level starts dropping at the usual rate for the season. So here is how to read it. Use the numbers on the right side and multiply them by 10. 2 would be 20 degrees and 3 would be 30 degrees Celsius. Since most of us are used to Fahrenheit here is a conversion table. AMOEBA THRESHOLD TEMP. - The horizontal orange line on the lower part of the chart represents the temperature above which the Naegleria fowleri amoeba begins to thrive in lake water and extra precautions should be taken to prevent infection. It is wise to always assume a possible presence of the amoeba in all warm fresh water bodies. When the lake temperature is above 80 F or 27.6 C there is a higher potential of this organism entering one's body and causing brain damage which usually results in death. For more information on this amoeba please click here. WEIR ELEVATION - Lake Conway has a weir on the south lake at a nominal elevation of 86.4 (Since the datum elevation was adjusted on 8/31/2000 and the weir has settled some by 2009 when it was stabilized the actual elevation is between 86.03 and 86.36). NORMAL WATER LEVELS - According to Orange County regulations the Normal High Water (NHW) is established as 6" above the weir elevation. The Normal High Water elevation (NHW) was established 10/1/1982 using NVGD 29 (National Vertical Geodetic Datum 1929) by code using an elevation 6" above the top of the weir at Daetwyler Ave. which was 86.4 on the same datum. In 2015 Orange County converted to using NAVD 88 (North American Vertical Datum 1988) 85.46 NAVD which is 0.955 feet lower. 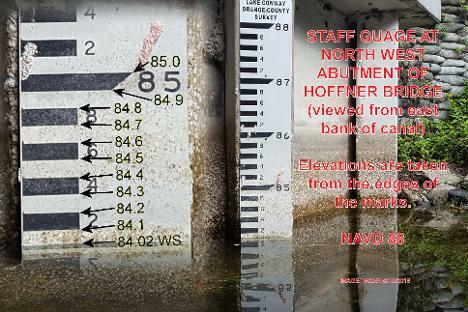 This establishes the new weir elevation at 85.445 feet and the new NHW at 85.945. For some reason unknown to me though Orange County is calling the new NHW at 85.85 (NAVD 88) which is 0.095 feet lower. The NHW level (85.85) corresponds to a 2015 Lake Stage of 94.43%. The "NORMAL" water elevation is a Lake Stage between 20% and 80% which equates to actual water elevations between 85.4 and 83.6 according to the 2015 Lake Stage data. 2015 LAKE STAGE - Simply put this is how full the lake is. Its scale in percent is on the left side of the chart and can be applied to all the traces that use the elevation scale. At 100% the lake has not been above this level during the 30 years between 1986 and 2015 (hence 2015 lake stage). At 0% the lake has not been lower than this in the 30 year time frame. At 50% the lake has been above this level for 15 years and below this level for 15 years. Lake Conway does not have a fixed water elevation. It is a natural body of water and is subject to fluctuations caused by nature and man. Since 1952 when data started being collected on this lake its level has consistently varied about 5' over generally 10 year periods and the average level has been dropping slightly. From 1968 to 1973 the level was artificially maintained using large groundwater pumps. Those pumps have been removed and current regulations prevent them from being reinstalled. Since the total rainfall over the past 100 years has not changed but water use by mankind has substantially increased, causing a net decrease in the water table elevation, it can be surmised this is at least one reason for the average lake level decrease. With this in mind, it is apparent that very old data may have little bearing on what we can expect from our lake today. The lake stage is a method of quantifying what is "normal" for our lake. In general, government agencies which monitor and establish "normal" water surface conditions use between 15 and 20 years of data as their standard. To be conservative the 2015 Lake Stage is based on the previous 30 years of data (1986-2015). The Lake Stage is calculated by finding the average lake elevation for each month then tallying how many months the lake was at each 0.1' elevation range (creating a histogram). Based on the number of months in each elevation range a percentage of months below that can be calculated resulting in the Lake Stage percentage for that elevation range. Since the Lake Stage is calculated using 30 years worth of data a 1 year shift in the data does not create a substantial difference in the results so the Lake Stage data will only be updated every 5 years. The "2020 Lake Stage" data will be recalculated in early 2021 using information from 1991 through 2020. Below are links to copies of the analysis which was distributed to those on the mailing list with the release of the monthly level chart. How Fast Does Torpedo Grass Grow? A tiny sprig of torpedo grass can grow to a 20 square feet in a few months. Click here to see documentation of this in action. Below are level charts from previous years. Each image is zoomable, printable at full size, and downloadable as a .pdf file using the controls at the top of each image. If you would like to view them full screen then select the Full Screen text. This will open a new window for the chart so you can easily flip between them. This gets updated annually by February. Below are tab delimited .txt files of the daily data in the fromat: date, elevation, rainfall, temperature. To view simply click on the link. To download right click then select "save link as..."
Click here to view a .pdf version of a report given to the Belle Isle Zoning Board of Adjustment in late 2016 while they were considering amendments to the Belle Isle dock ordinance. This report does not represent what was ultimately adopted but provided background information used in the amendments. The entire formula for considering relative dock lengths shown in this presentation was scrapped.